After an informative presentation from Google Certified Teacher, Michael Wacker, I realized how little I know about the company and all it has to offer. I have occasionally used Google Scholar to find articles for papers and Google Traduction was my lifeline when I was in Québec participating in the Explore program. I also used Google Docs one time two years ago to create a group presentation. But on the regular, other than using google as a verb and religiously googling everything under the sun (both pages and images), I consider myself fairly green to the world of Google. At the start of this semester, Dean introduced us to the wondrous Google Reader. I now use it to check my blog subscriptions two to three times per day. And to think I almost missed out on that gem too. Close call! A week after that I received some advice from my younger sister and signed up for Google Analytics to check the stats of my blog. I am proud to report that my fan base is growing and that my visitors span across Canada from Victoria, BC to Charlottetown, PE and even into the United States. Then came the presentation from Mr Wacker and now I can officially consider my mind blown. So many things you can do in Google, you literally don't need much else. I had created a quiz a few days ago in Google Docs using Forms and have now tallied my results. I used Docs again to create pie charts representing the percentage of folks that selected each option, so read on to find out how you stacked up against everyone else who participated as well as some fun facts about the correct answers. Over half of participants guessed that 1985 was the year that the first cell phone was released to the public. Motorola manufactured the first cell phone called the DynaTAC 8000x. It became available for purchase on March 6, 1983, offered 30 minutes of talk time and was priced at $3,995. 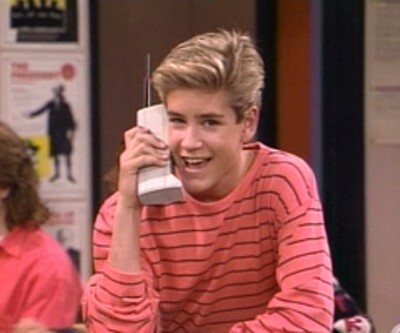 Children of the 80s and 90s may remember this model best as the phone that Zach Morris used on Saved By The Bell. Again about half the respondents guessed that Myspace was the first social network site. On the other end of the spectrum, no one was reeled into selecting Facebook. You were all too smart to fall for that one! SixDegrees.com was the correct answer, coming onto the scene in 1997. It was named after the six degrees of separation concept and allowed users to list friends, family members and acquaintances both on the site and externally. Users could send messages and post bulletin board items to people in their first, second, and third degrees, and see their connection to any other user on the site. It was one of the first manifestations of social networking websites in the format now seen today. It is still up and running, but only to people who were previously members of the site. Another section of the pie devoted to half, but this time it was the right answer, short message service. And again I didn't stump anyone with one option, smart management system. SMS is the service component of text messaging that allows short messages to be transmitted between cell phones. I stumped you good on this last one. Over 75% of you guessed the NOMAD Jukebox. I couldn't fool anyone with the iPod, but only one person got the correct answer. Audio Highway released its Listen Up player on September 23, 1996. They began shipping the player to the United States a year later. The device was never mass-produced with only about 25 units ever made. Interesting results! Of all the responses I received, only one person got all four questions correct. Hopefully you all learned something you can share with your friends, "Did you know...?" Now, back to my Google investigation. When you are on Google's homepage, you can access a "More" drop down list at the top which reveals an option "Even more". Here is where the lesser knowns of Google exist. One really cool product is Blog Search, which is another search engine, devoted solely to blogs. Where was this feature two weeks ago? I should have googled it. You can type in any subject that might be of interest to you and get millions of blogs in seconds. This would be a really great resource for teachers to connect with other teachers. I am finding more and more that I need to either update the OS for my Mac or buy a new one, because most new programs require at least OS X 10.5 and I'm still rocking 10.4.11. I am going to get left in the proverbial dust if I don't upgrade soon. And I have already found so many neat things I want to try, but am unable to access them because my system is no longer compatible. Geez, Miss W. Get with the times! Michelle, your survey questions were so eye catching and interesting, you are always coming up with neat ideas! Your blog is always a pleasure to read! Thanks Jordan, I'm glad you liked my survey. I wanted to do something a bit different and fun, so I thought a quiz might be a good idea! I had no idea this is how Google Translate works! I was exploring Translate this past week but never did I think to question how it did the translating! I think it's great that Translate scans actual human work for patterns, rather than just basing it's results on the so-called rules of a language, because those rules are, often, outdated and/or don't apply to every language variation/dialect. I actually saw the video in a blog I subscribe to and thought it was really interesting. It's almost creepy that a computer program can scan human work and create its own set of rules and patterns for translating. Such genius that went into designing the program. Definitely a tool I will make use of in my classroom!